According to the Volcano Discovery website, the eruption of Sangeang Api began at ~08:30 on 30 May 2014  which was later revised to 07:56 UTC . Sangeang Api occupies its own 13km wide island NE off the coast of Sumbawa Island and is also one of the most active volcanoes in the Sunda Islands . The island is comprised of two large trachybastlic to tranyandesitic cones. This volcano has had intermittent historic eruptions since 1512. The previous most recent activity occurred in 2013 with small white diffused plumes to around 10m above the crater, and an increase in volcanic earthquakes . The most recent activity and eruption began with precursory seismicity that prompted an alert on 21 May 2014 for the volcano. The eruption began on May 30 sending a plume of ash at least 12 to 14 km based on observations from multiple weather satellites . The plume eruption plume was captured by MODIS at 2:35 UTC on My 31, 2014 as well as being picked up by the Ozone Mapping and Profiler Suite on the same day (see attachment A-1). ISLA has an automated data processing system that includes array processing (using PMCC 4.0). 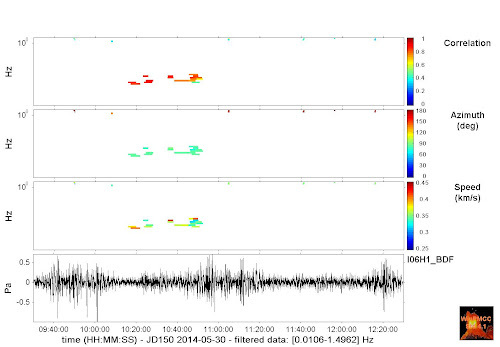 This system picked up the signal from the initial blast on the Palau (I39PW) station (figure 2.1.1). The Palau station is located ~2,450 km from the volcano with a back azimuth of 225° and is part of the Comprehensive Nuclear Test-Ban Treaty (CTBT) International Monitoring System (IMS) network. Using acoustic speed the expected arrival time of a signal (assuming 07:56 for the origin time) is 09:55 UTC (figure 2.1.2). 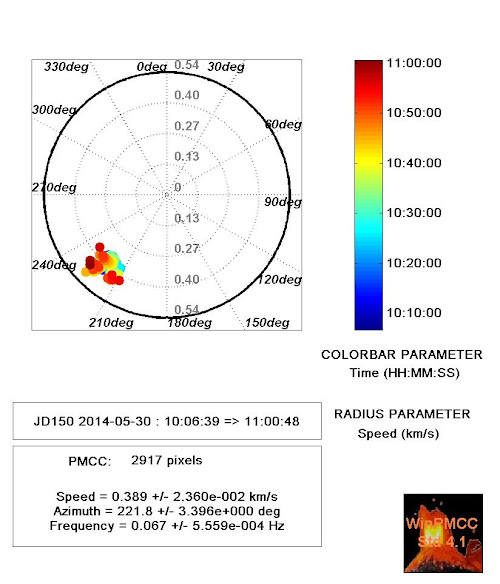 The data for this initial signal was then reprocessed using PMCC 4.15 and 6th octave bands. Initial results indicate that the bulk of the signal recorded in Palau for this initial blast is below 0.5 Hz (figure 2.1.3). Limiting the results to detections with a correlation of 0.8 or greater and within 15° of the expected back azimuth yields a signal beginning around 10:09:02 UTC a duration of 56 minutes and 3 seconds, with a back azimuth of 222.7 +/- 5.1° a speed of 0.395 +/- 2.95E-2 km/s and dominant frequency of 0.05 +/- 3.459E-4 Hz (figure 2.1.4). 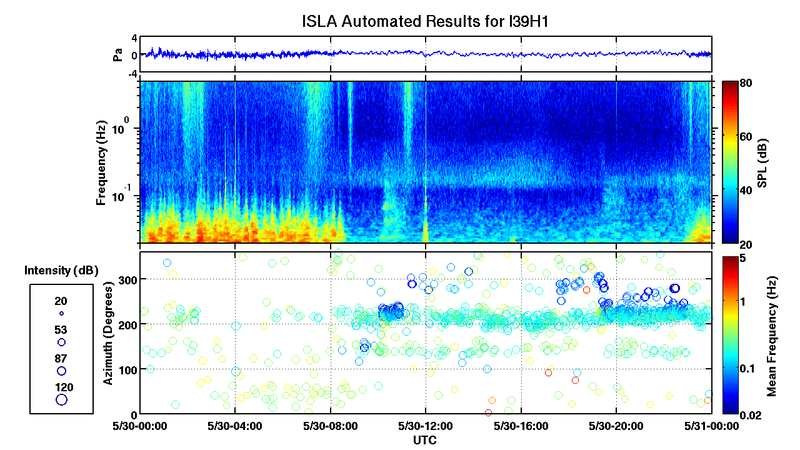 Figure 2.1.1: Results from the ISLA UH automated system; the top panel is the raw waveform for the 14hr period shown (from channel H1). The middle panel is a logarithmic spectrogram passed on the INFERNO algorithm . The bottom panel is the results from the automated array processing done using PMCC 4.0. 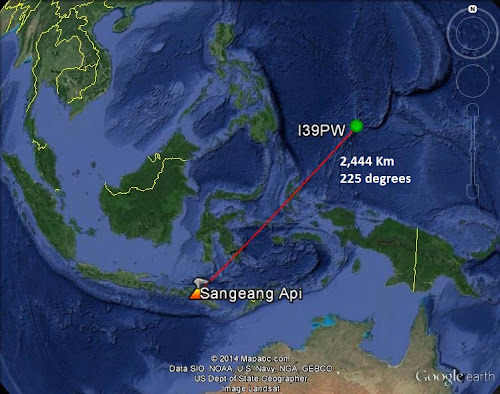 Figure 2.1.2: Location map of Palau (I39PW) relative to the volcanic eruption of Sangeang Api. The range for this station is 2,444 km, the expected back azimuth of 225°, and the predicted travel time is approximately 119 minutes. 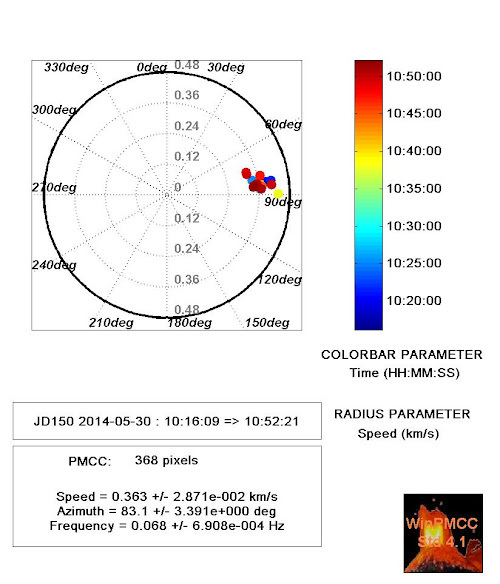 Figure 2.1.3: Array processing results for I39PW from PMCC 4.15 run between 1-0.01 Hz. Based on an origin time of 07:56 the expected arrival time of the signal would be approximately 09:56 UTC. 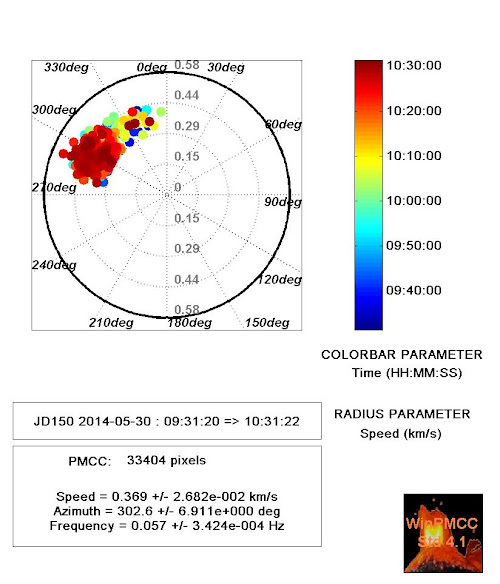 Figure 2.1.4: Radar plot of array processing results for I39PW attributed to the eruption. The expected back azimuth for this station is 225 degrees. Figure 2.1.5: Results from the INFERNO script IGNITE using the center frequency of 0.0032 to 1.3 Hz and a decimation factor of 5. This analysis uses the signal from I39PW-H1. Colleagues in Singapore reported that the onset time is approximately 07:56 UTC (with some significant error) . 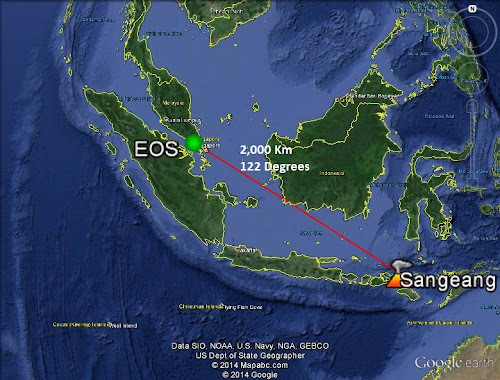 The eruption was recorded on the Singapore regional Infrasound network operated by EOS (Earth Observatory Singapore) which is located 2,000 km from the origin with a back azimuth of 122° giving it a predicted travel time of 98 minutes (figure 2.2.1). Results from the Singapore Station are shown in figure 2.2.2. Figure 2.2.1: Location map of Singapore Station (EOS) relative to the volcanic eruption of Sangeang Api. The range for this station is 2,000 km, the expected back azimuth of 122°, and the predicted travel time is approximately 98 minutes. Figure 2.2.2: Results from the EOS Singapore array, courtesy of C. Caudron . The green line denotes the origin time of the volcanic eruption, and the blue line denotes the expected arrival time. 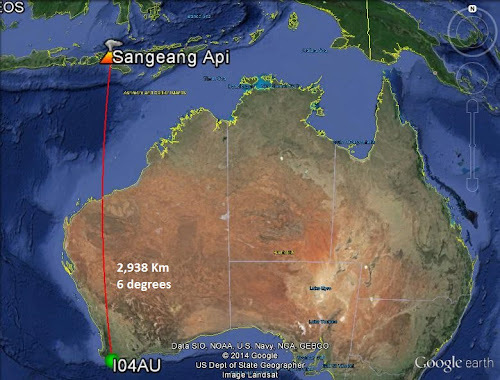 The Australian station I04AU is located almost due south (back azimuth is 6 degrees) of Sangeang Api volcano at a range of 2,938 km (figure 2.3.1). 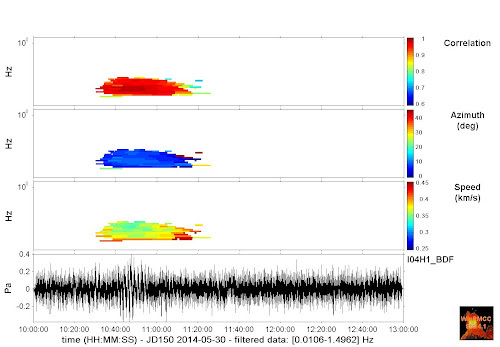 The eruption clearly shows up in the array processing (figure 2.3.2 and figure 2.3.3). However, the resulting beam formed waveform run through the Ignite Inferno processing does not show as clear of an arrival (figure 2.3.4). Limiting the results to detections with a correlation of 0.75 or greater and within 15° of the expected back azimuth yields a signal beginning at around 10:30:19 and with a duration of 51 minutes 8 seconds, a back azimuth of 6.8 +/- 2.31° , a speed of 0.375 +/-0.0023 Km/sec and dominant frequency of 0.037 +/- 2.3E-4 Hz. Figure 2.3.1: Location map of Narrogin, WA (I04AU) relative to the volcanic eruption of Sangeang Api. The range for this station is 2,938 km, the expected back azimuth of 6°, and the predicted travel time is approximately 144 minutes. Figure 2.3.2: Array processing results for I04AU from PMCC 4.15 run between 1-0.01 Hz. Based on an origin time of 07:56 the expected arrival time of the signal would be approximately 10:20 UTC. 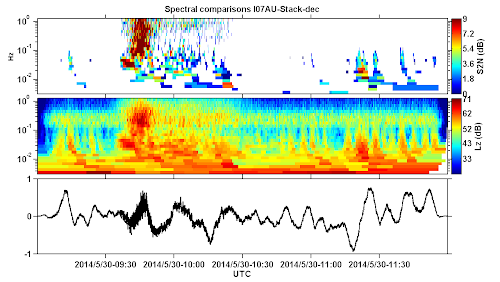 Figure 2.3.3: Radar plot of array processing results for I04AU attributed to the eruption. The expected back azimuth for this station is 6 degrees. Figure 2.3.4: Results from the INFERNO script IGNITE using center frequencies of 0.0016 to 0.32 Hz and decimated by a factor of 10. The waveform used for this analysis is the beam-form waveform resulting from the array processing results. 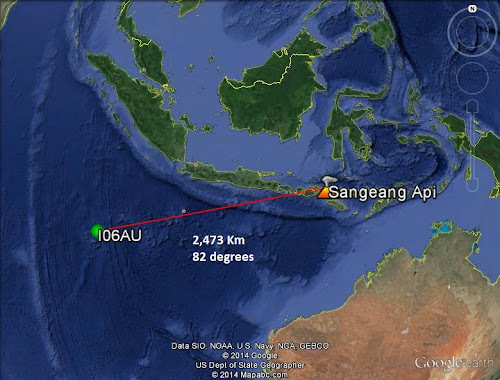 The Australian station I06AU is located on Cocos Island and is WSW of the volcano (back azimuth of 82 degrees) at a range of 2,473 km (figure 2.4.1). 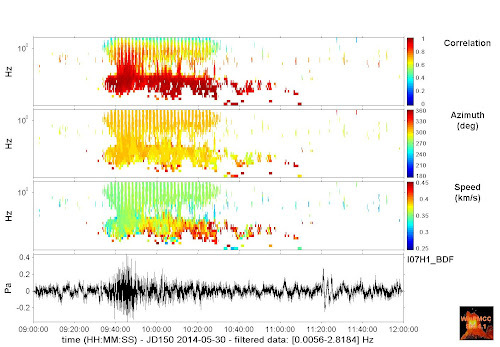 Only a small faint signal from the eruption was seen in the array processing results (figure 2.4.2 and figure 2.4.3), and no obvious signal in the raw or stacked data (not shown). Due to the season the signal was expected to travel west, however the highest amplitude signals were seen to the east and weakest to the west (I06AU and no results at I52GB). Limiting the results to detections with a correlation of 0.6 or greater and within 15° of the expected back azimuth yields a signal beginning at around 10:16:09 and with a duration of 36 minutes 12 seconds, a back azimuth of 82.8 +/- 3.398°, a speed of 0.362 +/- 2.977E-2 km/sec and dominant frequency of 0.069 +/- 7.358 E-4 Hz. Figure 2.4.1: Location map of Cocos Island (I06AU) relative to the volcanic eruption of Sangeang Api. The range for this station is 2,473 km, the expected back azimuth of 82°, and the predicted travel time is approximately 121 minutes. Figure 2.4.2: Array processing results for I06AU from PMCC 4.15 run between 1-0.01 Hz. Based on an origin time of 07:56 the expected arrival time of the signal would be approximately 09:57 UTC. 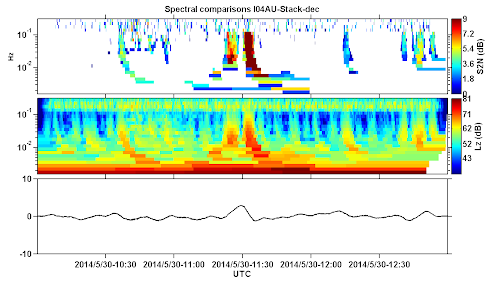 Figure 2.4.3: Radar plot of array processing results for I05AU attributed to the eruption. The expected back azimuth for this station is 82 degrees. 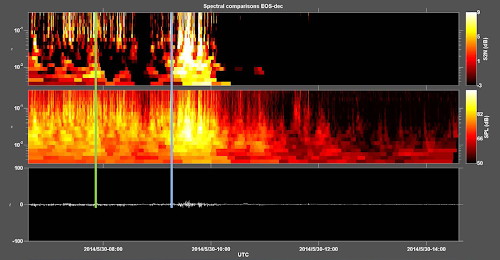 The north Australian station I07AU picked up a beautiful signal from the eruption. This station is located at a range of 2,095 km from the volcano with a back azimuth of 306 degrees (figure 2.5.1). The signal recorded at this station has two distinct bands within both the array processing results (figure 2.5.2 and figure 2.5.3) and in the stacked data processed using Inferno (figure 2.5.4). The signal at this station warrants a more detailed analysis. Limiting the results to detections with a correlation of 0.75 or greater and within 15° of the expected back azimuth yields a signal beginning at around 09:24:15 and with a duration of 1 hour 35 minutes 41 seconds, a back azimuth of 303.5 +/- 9.756°, a speed of 0.374 +/- 3.025E-2 km/sec and dominant frequency of 0.038 +/- 2.458 E-4 Hz. 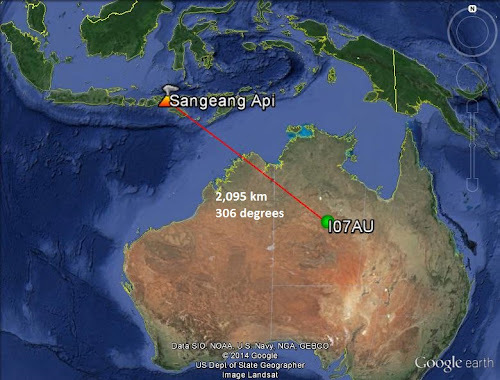 Figure 2.5.1: Location map of Central Australia (I07AU) relative to the volcanic eruption of Sangeang Api. The range for this station is 2,095 km, the expected back azimuth of 306°, and the predicted travel time is approximately 103 minutes. Figure 2.5.2: Array processing results for I07AU from PMCC 4.15 run between 1-0.01 Hz. Based on an origin time of 07:56 the expected arrival time of the signal would be approximately 09:39 UTC.There are two distinct bands of coherent signal from the eruption. 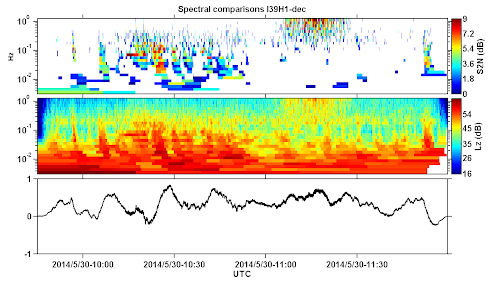 Figure 2.5.3: Radar plot of array processing results for I07AU attributed to the eruption. The expected back azimuth for this station is 306 degrees. No detections associated with this event were recorded or calculated at I52GB. Acknowledgements: UH ISLA would like to thank the US NDC, and IRIS and the Australian NDC for making the data open and available. We would also like to thank our colleagues at EOS in Singapore for their results. We would also like to thank Dr. Peter Webley for help with the satellite data. * The eruption classification is based on the plume height information reported by the Global Volcanism Program of 13.7-15.2 km a.s.l. With only this information the eruption likely falls within a VEI of 4, which is classified as Peléan / Plinian. 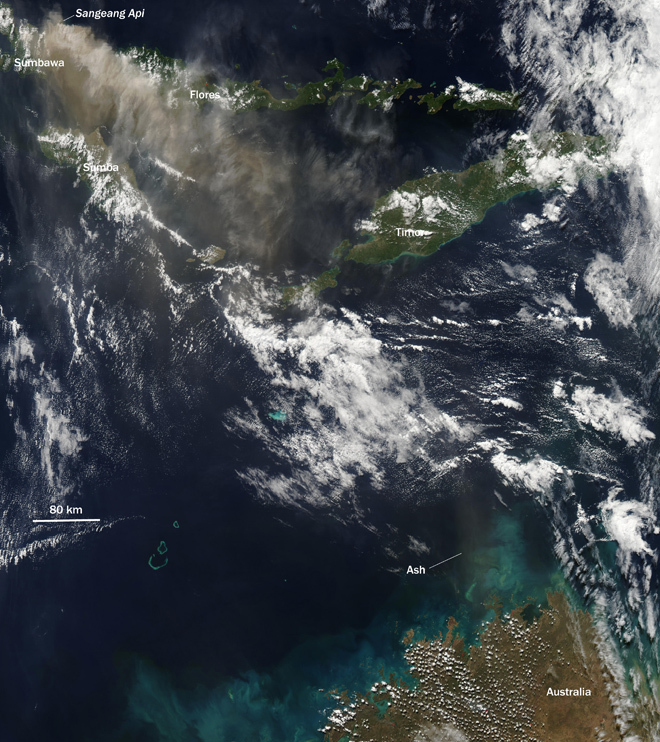 Figure A.1: MODIS image showing the plume resulting from the eruption relative to Australia. PVMBG reported that during January-29 May diffuse white plumes rose at most 25 m above Sangeang Api’s crater. 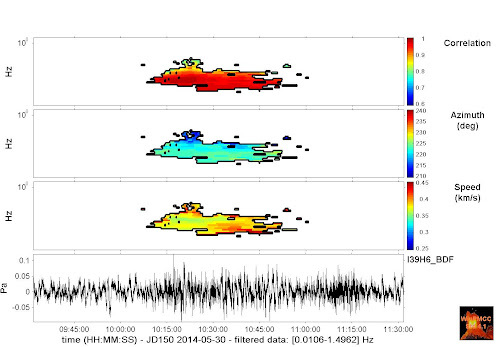 On 30 May seismicity increased, with tremor starting at 0500 and becoming continuous at 1348. An eruption at 1555 generated an ash plume that rose 3 km and drifted W, causing ashfall over the sea. The Alert Level was raised to 3 (on a scale of 1-4). The island has no permanent settlements, and is only occupied during the growing and harvest seasons; civil authorities evacuated 135 people to the mainland. Based on satellite images, pilot observations, and the Indonesian Meteorological Office, the Darwin VAAC reported that on 30 May an ash plume rose to an altitude of 15.2 km (50,000 ft) a.s.l. and drifted 440 km E and 750 km SE. BNPB reported that on 31 May two larger explosions occurred at 1330 and 2242. According to the VAAC, ash plumes from those explosions rose to altitudes of 13.7-15.2 km (45,000-50,000 ft) a.s.l. and drifted 280 km NW and other various directions. Later in the day the ash plumes became detached. Ashfall affected many areas in the Bima Regency on the mainland, including Wera, and prompted the evacuation of 7,328 people from four villages within a radius of 8 km from Sangeang Api. The Bima and Tambolaka airports were temporarily closed. According to a news article, all flights to and from the Darwin International Airport in Australia on 31 May were canceled. The VAAC noted that ash plumes rose to an altitude of 4.3 km (14,000 ft) a.s.l. on 1 June and drifted W and SW. During 2-3 June ash plumes rose to altitudes of 3-4.3 km (10,000-14,000 ft) a.s.l. and drifted 45 km W.
5. M. A. Garces, “On Infrasound Standards, Part 1 Time, Frequency, and Energy Scaling,” InfraMatics, Vol. 2 No. 2, 2013, pp. 13-35. doi: 10.4236/inframatics.2013.22002.